Eclypse International Corporation is a recognized supplier of circuit analysis equipment. We design and manufacture our own line of wire and circuit test equipment; specifically tailored for the demands of modern manufacturing and maintenance environments. Eclypse also offers consulting, design, and other engineering services related to the application and usage of our products. 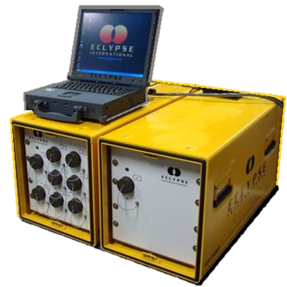 Eclypse products are found in DOD / Military, aviation, aerospace, and commercial industries, and are used to verify circuit integrity of wire interconnect systems, electronic assemblies, and electrical boxes. With a wide range of built in measurement and stimulus sources; automated test procedures can be developed to support multiple devices and platforms. As a result, this reduces the need for individual dedicated test equipment. Our open software framework allows customization and integration with outside resources such as; data bases, online documentation, and personalized data screens. For more than 25 years, Eclypse has built a reputation for our customer first approach and our flexibility in facing unique challenges. Our staff combined has decades of experience developing and delivering projects from simple off the shelf products to complete fully integrated test program solutions. In addition to having shipped 100’s of systems to the field, Eclypse is known for exceptional service and support of our products. Through innovative design, a strong focus on quality, and a passion for surpassing expectations, Eclypse is the company of choice to handle circuit analysis projects. We will deliver products and services on time, every time, which meet or exceed the expectations of our customers for quality and value.